Our philosophy is “to teach you your swing.” We feel it is important to teach players specific to their goals, personalities and abilities. The golf swing is a natural motion and we all do natural things differently. We teach students to their optimal learning style. We use video, Explanar and many other teaching aids. 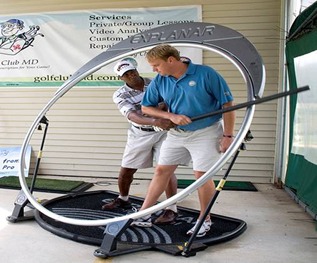 We feel Explanar is the most effective swing training tool on the market today. The results are amazing! Explanar is a complete golf training system based on the fundamentals of the swing plane and the biomechanics of the body, promoting the ideal movements of the golf swing. I’ll teach you your swing and Explanar puts you into the optimal, biomechanical positions. You gain power and accuracy with Explanar. Explanar “the best teaching aid I have ever seen, it works,” Butch Harmon.